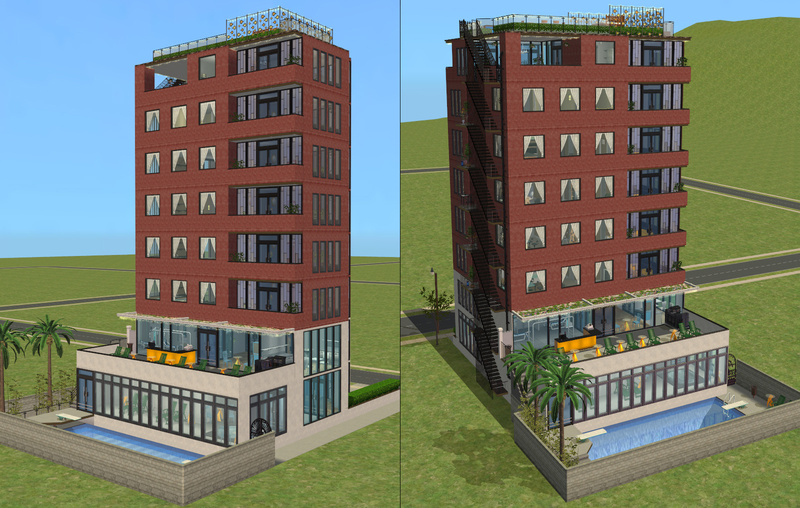 Multi-family homes/For Apartment Life EP/Annoying neighbors. It's been a while since you've seen anything from me and there are two reasons for that. First, I've had a job so my free time was significantly limited, and secondly, I'm trying to start my own contemporary dollhouse furniture business, so any free time I still had went straight into that. On Thursday, I was let go from my job. It was an intern position that was supposed to only last 4 months and lasted over a year, but I figured out a few months ago it wasn't going to turn into a real job. While I was planning on giving notice soon myself, they beat me to the punch and I found myself suddenly unemployed. 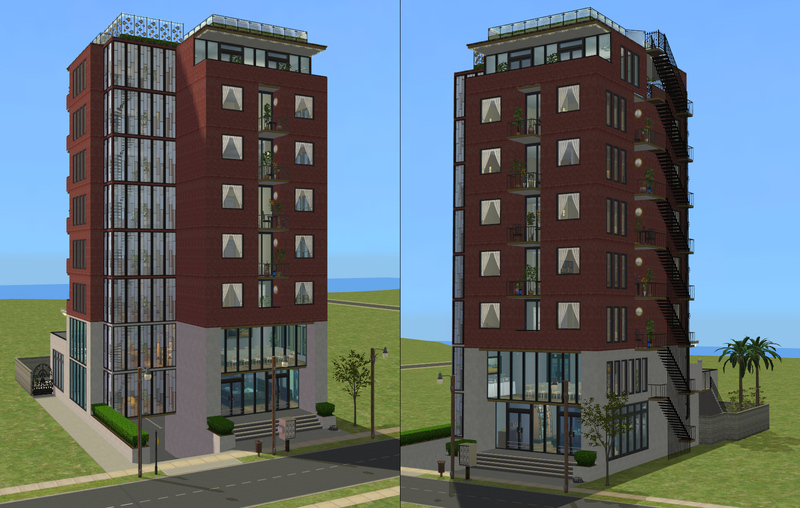 To dull the shock of this, and to prove to myself that I can accomplish things, I spent the last 2 days finishing this apartment building that I started ages ago back in Feb when Zarathustra started uploading his amazing highrise apartment buildings. They were so inspiring I wanted to make my own. 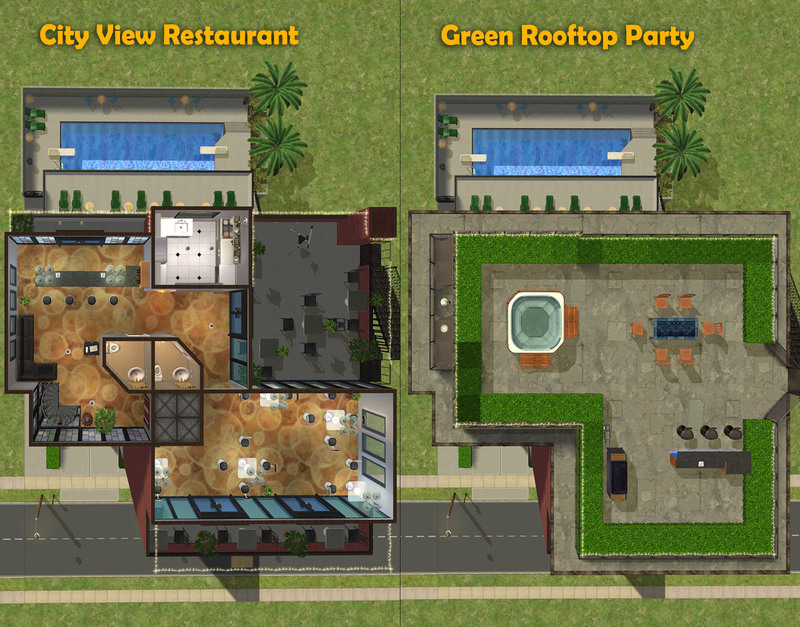 Before we get started, I *highly* recommend you get MogHughson's Apartments and Shopping, on the same Lot! mod if you don't have it already. 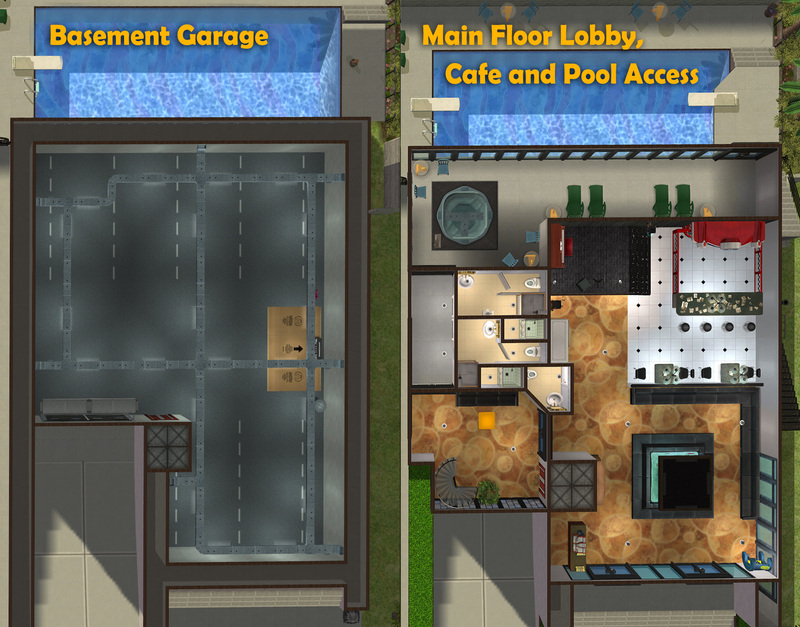 My lot will work without it, but with it, you will have NPC coffee baristas, bartenders, and the DJ. 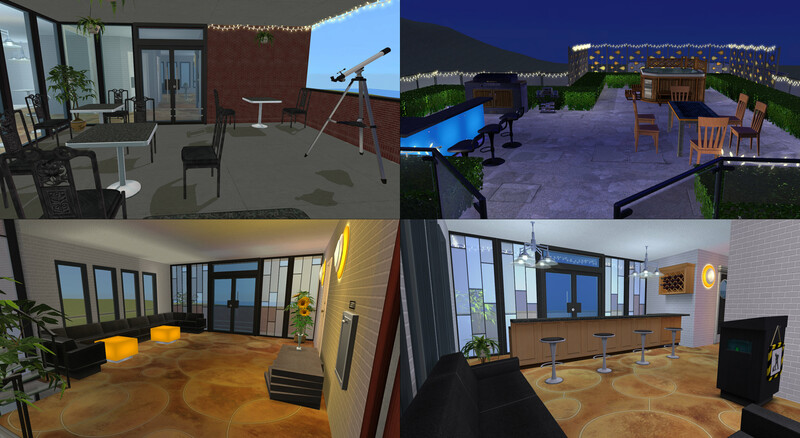 This property has tons of amenities your sims will be sure to enjoy. Let's start at the bottom shall we? We have an underground parking lot because parking downtown is always at a premium, and a small crowd surrounding a local breakdancer can often be found there. On street level again is another performing artist, a human statue. Neither of these artists seem to bother our patrons much, so we let them stay. They often end up bringing customers to us! 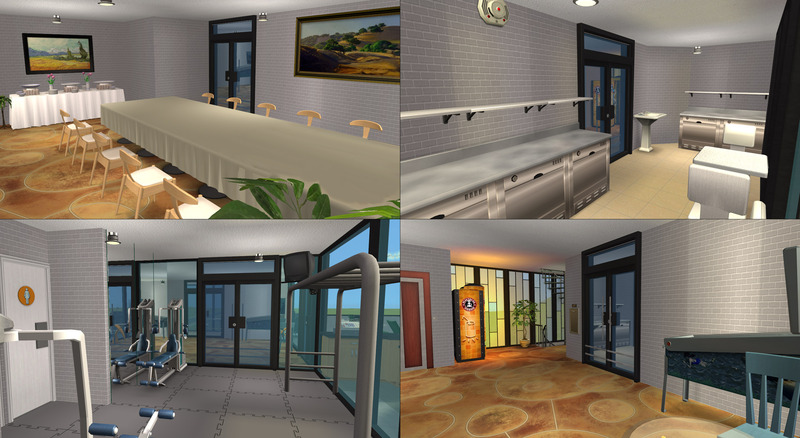 Inside to your left in the lobby is a coffee barista and the local tabloids. 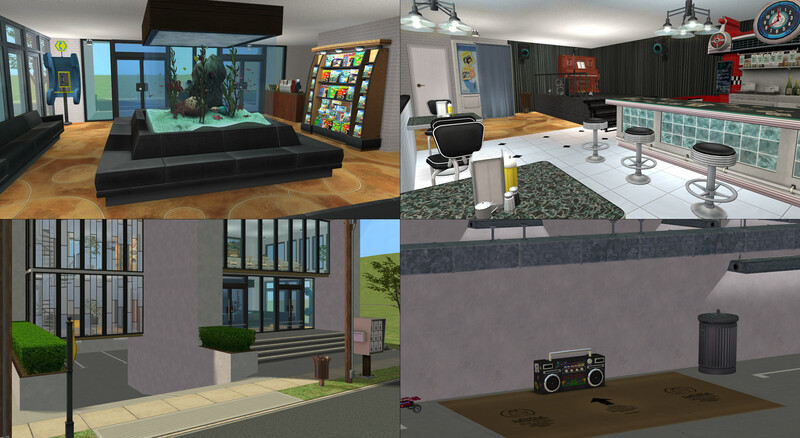 You can enjoy your morning coffee and paper here near the calming large salt water fish tank. Towards the back is a small cafe and sometimes you can catch a show or a standup event. There is also a photobooth to help you remember your experience. Our resident's security is a top priority for us, so to access any more of our building you either need a key card or be buzzed in by another resident. Inside these doors to your right is our pool facility. Changing rooms and restrooms are available. 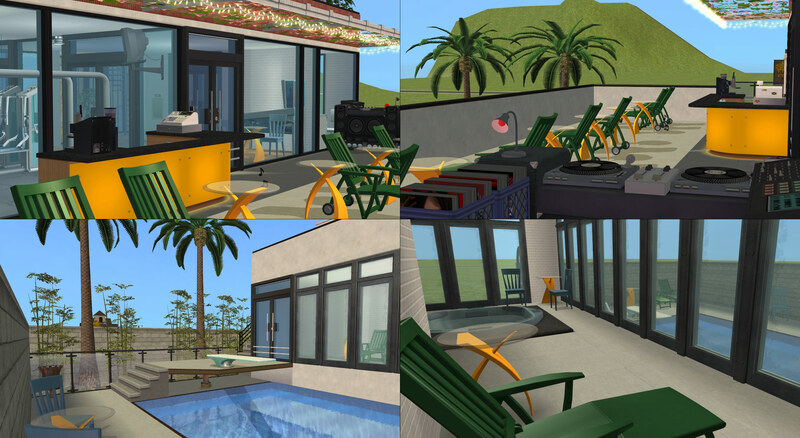 There is a hot tub, and the full wall windows face south, so you can take in the lovely weather indoors if it gets too hot or too cold. Through these next double doors is the pool itself, we have two diving boards and more chairs around the pool. Up these stairs will take you to our deck where you will find more chairs to lay out on. A bar, espresso machine, and live dj will make your time enjoyable. Inside to the left is our gym facility. We only have a few machines, but there is always room for more (if you have UNI) and restrooms of course. The laundry facility is back out off the main hall to your right and there are vending machines and a pinball machine for while you wait. We have plenty of machines always available. Through these two sets of double doors (for sound proofing) is a conference room which can be booked for business events or small parties. 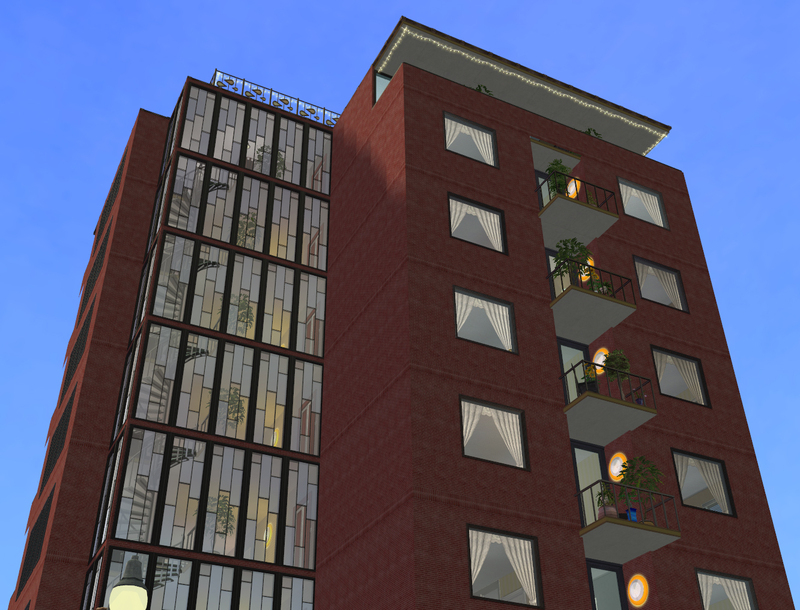 The next five floors are our apartments. 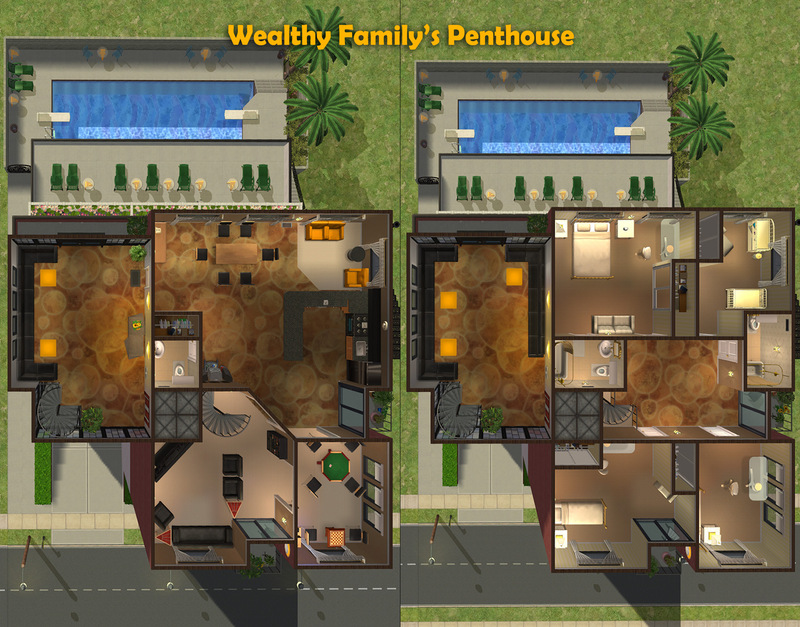 The first three are a single floor and are 1 or 2 bed, with 1 or 2 baths, and the fourth apartment is a double floor penthouse. 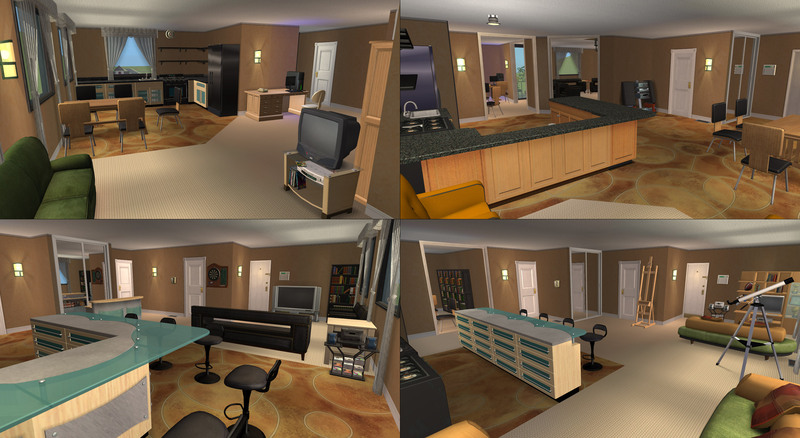 It has 4 bedrooms and 2.5 baths. 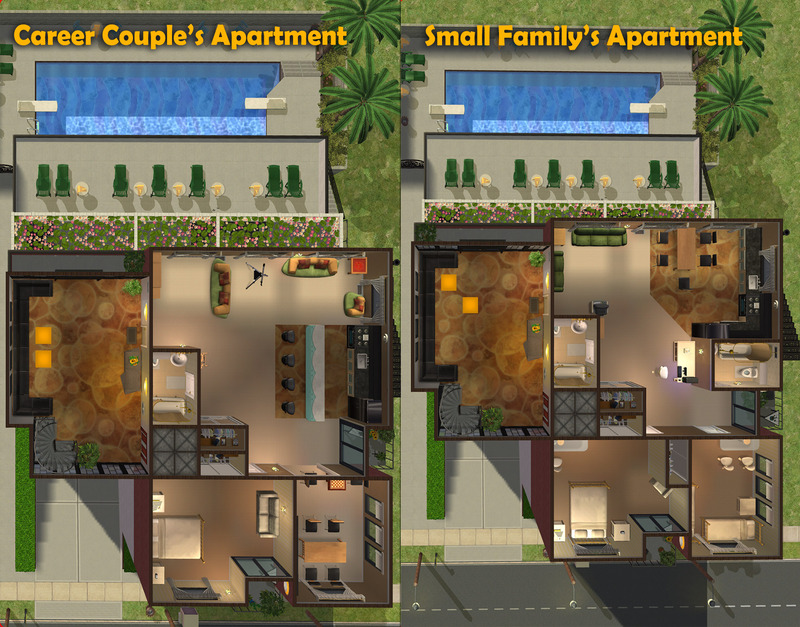 Each apartment is set up for a different size family unit, so we can cater to whatever your housing needs may be. 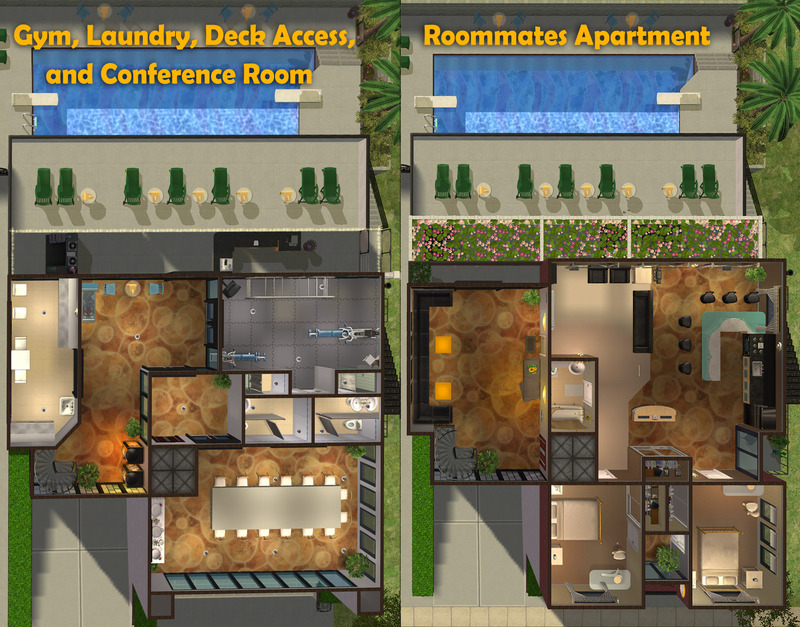 All units come fully furnished (unless you choose not to, or don't have a hack/update for it), all have bedroom and hall closets, 2 balconies with access to the fire escape, security systems, smoke detectors, and phones installed. MogHughson's Apartments and Shopping, on the same Lot! Creds to Zarathustra for inspiring me to do this. and to raquelcesar for the only custom content I included.